Speculation is growing about why North Korean leader Kim Jong-un has allowed artists from Seoul to perform in Pyongyang despite his nation's crackdown on South Korean entertainment. Sources familiar with North Korea said last week that Kim made an exception as part of efforts to maintain momentum on the cross-border dialogue. The visit of South Korea's 120-member performance troupe comes after the North's Samjyon Orchestra performed here during the PyeongChang Winter Olympics. A source said that although Kim feared an influx of foreign media and the impact on "ideological purity," he was confident the South Korean artists' visit would not affect Pyongyang's elite class. "Those who are invited to the concerts are selected people, such as the elite from the Workers' Party and the military," the source said. "Kim may have judged that his regime can control these people." Most of the South Korean art troupe and taekwondo athletes scheduled to perform in Pyongyang arrived in North Korea on March 31 ahead of the historic inter-Korean summit. The 120-member group led by Culture, Sports and Tourism Minister Do Jong-whan arrived in Pyongyang, on March 31, via a direct air route between the two Koreas. North Korea's culture minister Pak Chun-nam and Hyon Song-wol, head of the North's all-female Moranbong Band, greeted them at the airport, according to pool report. Cho Yong-pil, one of South Korea's most influential singers, K-pop girl band Red Velvet and Seohyun, a member of Girls' Generation, also a K-pop girl band, are among the delegates. The delegation also includes staff members, taekwondo performers and government officials. The performances will be the first by South Korean artists in the North since 2005, when Cho Yong-pil gave a solo concert in the North's capital. "I, along with Korean pop musicians, will do my best to make the historic first concerts in Pyongyang by South Koreans in 13 years successful," Minister Do said in a statement. "I hope the inter-Korean exchanges and cooperation that resumed during the PyeongChang Winter Olympics will further increase with the South Korean art troupe's performances in Pyongyang." He pledged to do all he could to ensure that culture and sports will help open the way for peace on the Korean Peninsula and inter-Korean reconciliation. Do said that while in Pyongyang he would discuss with North Korean sports and culture officials ways to expand cooperation. 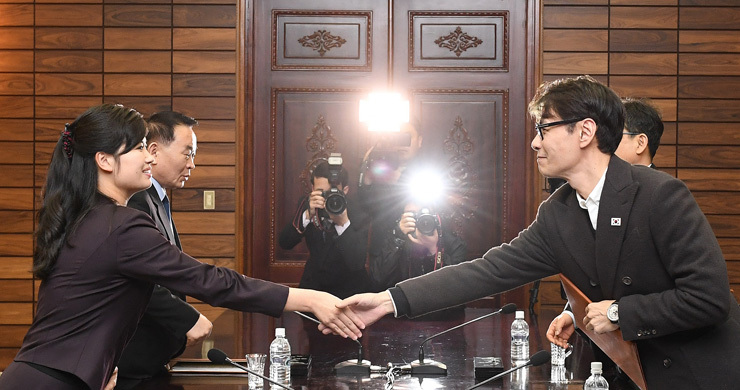 During a meeting with North Korea's culture minister Pak, Do said he hoped the planned performances would serve as a cornerstone for inter-Korean cultural exchange and cooperation. Pak responded by saying Koreans should work together to promote inter-Korean relations, according to the pool report. Yoon Sang, a popular composer who is the art troupe's musical director, said he felt "honored but under inexplicably high pressure" at the same time. "We'll do our best out of the aspiration that a spring of peace should come to the Korean Peninsula as in the concerts' title 'Spring Comes,'" he said.